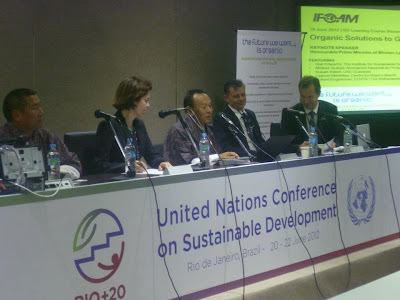 The Sustainable Development Dialogues are an initiative organized by the Brazialian Government, with the of the United Nations' endorsement. 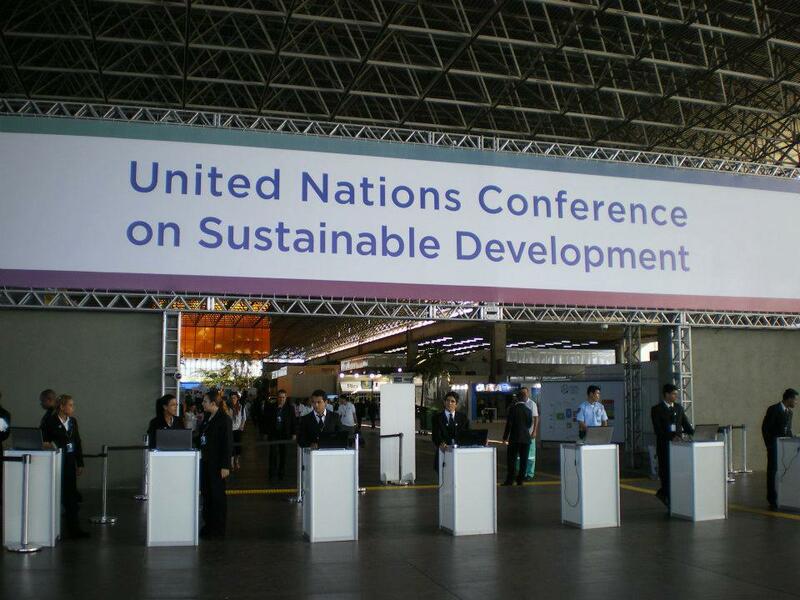 The so-called "Dialogues" were held in Riocentro between June 16 to 19, four days before to High Level Segment of the United Nations Conference of Sustainable Development. This initiative represents an innovative way to engage and to include civil society in International UN Conferences, helping citizens to build a bridge to the Heads of State and Governments, on the belief that public participation is essential to the consolidation of sustainable development. The priority was to come up with a set of Recommendations representing the view of the Civil Society to be presented at the Round Tables during the High Level segment of the Rio+20 Conference. The Dialogues focused on ten crucial themes of the sustainable development agenda: 1) unemployment, decent work and migration; 2) sustainable development as an answer to the economic and financial crises; 3) sustainable development for fighting poverty; 4)the economics of sustainable development, including sustainable patterns of production and consumption; 5) forests; 6) food and nutrition security; 7) sustainable energy for all; 8) water; 9) sustainable cities and innovation; 10) oceans. At the end of the discussions, 30 recommendations were selected, three for each theme: one chosen by an open vote on the internet, one by the audience in Rio (composed by a number of representatives from the private sector, NGOs, the scientific community, among other major groups) and one by the panelists of experts that led the debate. Over 63,000 people from 193 countries gathered nearly 1.4 million votes on the internet, while the debates in Rio had an average audience of over 1,300 people. On Sunday June 17th, from 11.00 am to 1.30 pm, a panel gathered in Pavilion 5 of Riocentro to debate "the economics of sustainable development, including sustainable patterns of production and consumption". The panel warned once again that our current models of consumption and production are seriously undermining the survival of our planet: we are currently consuming more natural resources than the planet is able to regenerate and we are producing more waste than the planet is able to absorb. Humanity uses the equivalent of 1.5 planets each year. If we continue with the current patterns of consumption and production, in 20 years we would need more than 4 planets. Prime Minister of Bhutan, Lyonchoen Jigmi Yoezer Thinley, giving a speech at the SD Learning course on "Organic Agriculture - Locally Driven Solutions to Global Priorities"
A change in technology is not enough. During the debate, the need of a real paradigm shift was stressed, in order to move from consumerism to a model of well-being based on a dematerialization of life. According to this perspective, consumerism should become an instrument and not an end for itself. The panel also stressed the need to phase out harmful subsidies and develop green tax schemes, to promote sustainable public procurement worldwide as a catalyst of sustainable patterns, and to adopt an holistic approach to sustainable development. This means that we have to keep in mind the three pillars of sustainable development (economic, social and environmental) are strictly interconnected and the humanity is deeply dependent to planet Earth and vice versa. This approach can only be adopted through the education of the future generations on the principles of sustainability, including sustainable lifestyles and consumption patterns, which must begin in schools at a very early stage and through a global educational campaign. This new model also implies a change in how we measure prosperity. The Gross National Product must be integrated with other indicators that could include environmental damages and social impacts. However, as Dr. Mathis Wackernagel stressed: "There is a hole in the boat but nobody fixes it if the neighbour doesn't start fixing it first”. He used this metaphor as a call for change now. “We have no more time to wait and waiting for the global consensus is wasting the future. We must start now”. The captains have already left the helm…and us, inhabitants of the Planet, do we still want to wait them to come back to fix our boat?"